They can help train the squat’s lifting pattern to new lifters learning the technique. 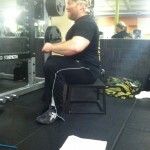 They can teach the lifter how to comfortably sit into their squat. For experienced lifters, box squats can increase explosive power out of the bottom of the squat. They do this by breaking the chain between the eccentric and concentric phases of the squat. You are forced to begin the concentric phase of the lift from a dead stop. To do this you need to generate a great deal of force to initiate the lift. Rotating alternate variations of primary lifts, such as replacing squats with box squats, presents alters the lift’s stimulus and can help prevent your body from adapting to your normal squat program. This leads to consistent strength gains. Box squats are much more than simply sitting down on a box and squatting back up. There a number of important technique points that will maximize their effectiveness. Equipment: most of the equipment you will use is the same for your standard barbell squats. Squat rack – you will be lifting too much weight to lift onto your shoulders. Set the rack height at mid to upper chest height so that you will have good leverage to unrack and walk the weight out. Set the safety pins low enough so that you can squat to full depth without bumping them and high enough so that they can catch the bar if you get into trouble. Box – a plyo box makes a perfect choice. Select a box that will allow you to reach parallel or below when you squat to it. If you don’t have a box at the right height your gym may have aerobic steps you can set up to the right height. It’s not uncommon to see someone using a bench for the box. 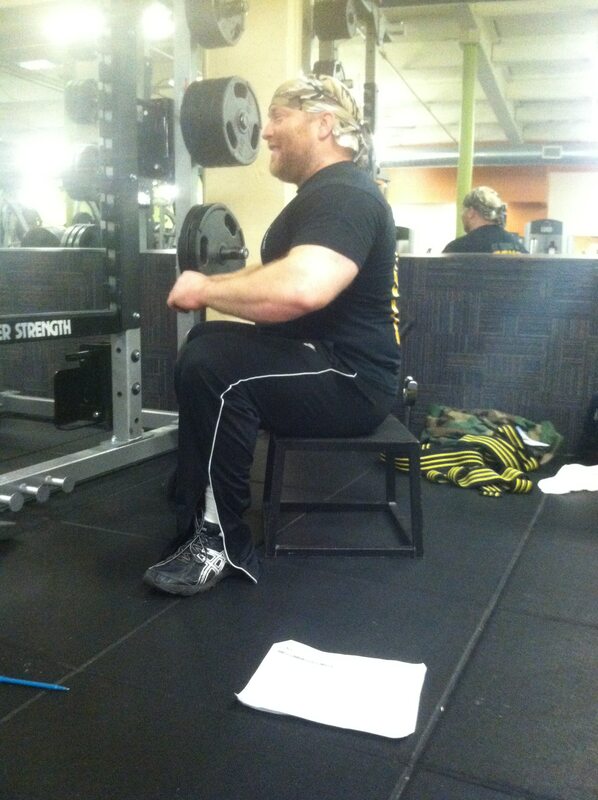 In most cases, a bench is far too high to make an effective box for box squats. Basic technique for box squatting is very closely aligned, but it does differ from the standard barbell squat beyond just the addition of the box. Bar Placement: Demonstrated here is the low bar position. This will give you leverage for maximum power. 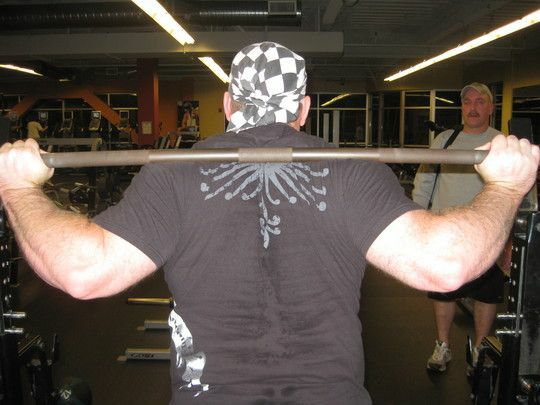 The bar should rest on the back of your delts at the base of your traps. If you slide the bar down your traps as you step under it, you will find a groove between your delts and traps the bar slides right into. Hand Placement/Grip: Grip the bar as close to your shoulders as your flexibility will allow. Moving your hands out wider, away from your shoulders will reduce tension on your shoulders and elbows. If you lack flexibility a wider grip can reduce some strain but it will also loosen your upper back, reducing your stability. Conversely, bringing your hands in will tighten your upper back, increasing your stability. 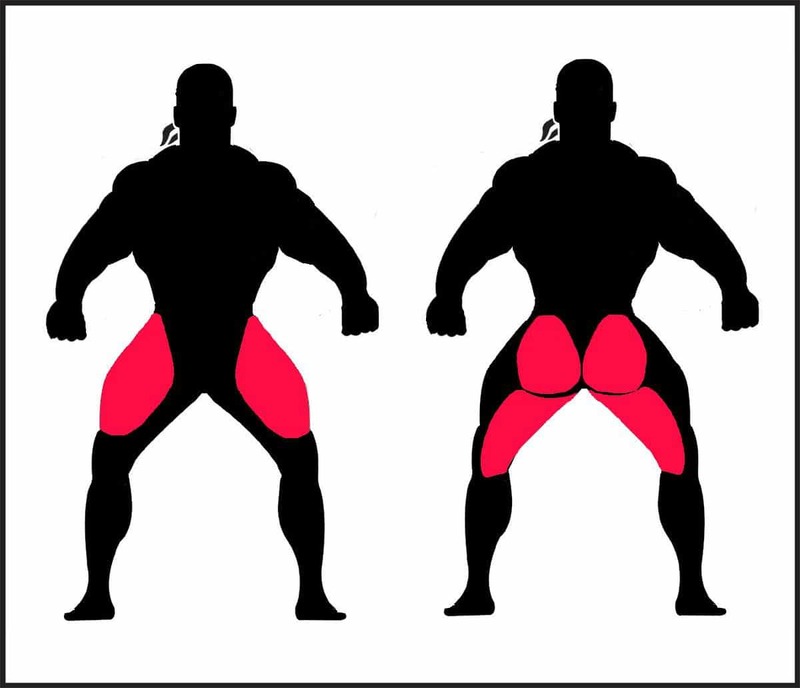 A wide stance also reduces the range of motion of the squat. 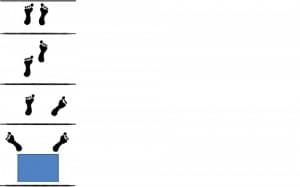 Widening the stance may provide better mechanics for lifters with proportionately long femurs. A wider stance increases emphasis on your hips, reduces tension on your glutes and hamstrings, and can make it more difficult to hit full depth. Too wide of a stance without corresponding hip strength can cause your knees to cave in during the squat. A narrower stance increases the stretch of your glutes and hamstrings allowing them to aid more in the lift. With the proper foot position, a closer stance can make it easier to squat to depth. Too narrow of a stance could end up forcing your hips farther back causing you to lean more during the squat. Step under the bar using the hand and bar placement as discussed above. 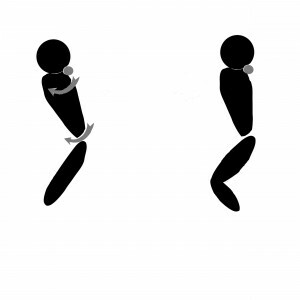 To unrack the bar, your feet should be hip width apart, with your toes pointed forward (see the first frame of the walkout diagram below). Your stance to unrack the bar should be very close to your conventional deadlift stance. Rotating your torso as a solid unit, drive your hips forward under the bar. Lift the bar straight up out of the rack using strong leg/quad drive – the bar should pop right out of the rack. Watch your feet as you walk out, to ensure correct placement. Take three short, quick steps back from the rack to set up. Your first step moves you straight back to clear the rack. Your second step moves your other foot into the squatting position. Your third step moves your first foot out to the side and into the squatting position. Your heels should be just slightly in front of the box. Begin your descent by driving your knees outward and sit down into the squat as if sitting into a chair. Keep your head and chest up as you descend, and your back flat throughout entire lift. Control your descent to the box. You should not anticipate the box, yet you should land on the box lightly. Note: Don’t drop onto the box hard. With the weight on your back this could put significant pressure on your spine. Depth: Depth is, of course, predetermined by the height of your box. As noted above box height should be at parallel or just below. Come to a complete stop on box. Stay tight while stopped on the box. Drive the weight back up explosively. Drive your knees out and your elbows forward to overcome the inertia of the dead stop. Concentrate on moving the bar down and up in a straight line over your center of gravity. Sit onto the box like you would be sitting into a chair, keeping the bar directly over the center of your feet. Avoid leaning forward as you start back up, this will reduce the effectiveness of your leg drive as you initiate the lift. Drive back into the bar and drive your hips forward as you come off the box. Because of the dead stop, you will not be able to squat the same load you can with a standard barbell squat. Box squats will prepare you to handle heavier barbell squats, since you have a rebound out of the hole. Using a box that is too high: the pox you use for box squats should allow you to squat to full depth. Not coming to a full stop on the box: also known as ‘touch and goes’, this technique can help you learn to find proper squat depth (provided you have the right height box), however not coming to a full stop on the box negates the effectiveness of the lift. Leaning forward to start up off the box: leaning forward as you start up off the box takes the tension off your legs. This allows you to bring your hips up then finish the lift as a good morning. Drive the bar straight up to build leg drive and power into the bottom end of your squat. Until you learn how to sit onto the box lightly, keep the weight relatively light. The only thing between the bar and the box is your spine – landing on the box hard with a heavy weight on your back can increase your risk of injury. Perform every box squats repetition with perfect form. This will maximize the effectiveness of the lift and minimize your risk of injury. Touch and Go Box Squat: Touch and go is more of a squat than a box squat. Squat down until you feel the box then immediately drive back up. You should never transfer any of the weight to the box, or come to a complete stop on the box.